INDIAN ISLAND – ssipsis (born Eugenia Theresa Thomas) passed quietly away early on October 27th of 2015, with her eldest daughter next to her. Throughout her ordeal with Alzheimer’s disease, she showed her family, friends and caretakers what it means to be strong and resilient in the face of a definite outcome. Her good humor was never taken from her. She was born June 10th, 1941, on Indian Island to Dorothy Phillips, Mohawk, and William (Billy) Thomas, Penobscot. She was lovingly raised by Eugenia Mary Thomas. She earned her Sociology degree at Colby College to become a social worker, and earned fellowship into the Ford Foundation. While attending college, she married Kenneth C. Thompson, who graduated to become an attorney at law. Together they had four children. She lived a life of freedom of thought, and spoke the language of truth. 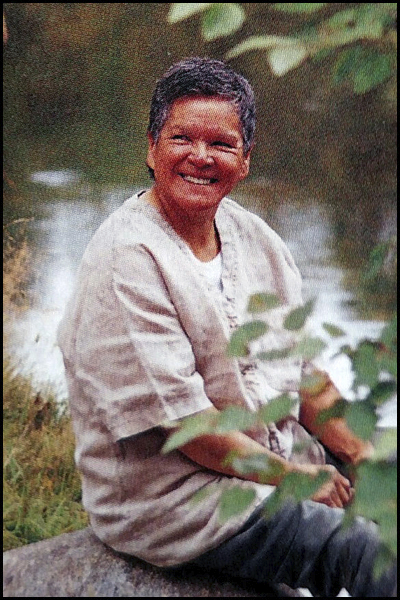 Her poetry and stories, her artwork, her lectures and books all contributed to the advancement of Indigenous Peoples. Later on, she demonstrated true Native lifestyle in the woods of Northern Maine for twenty years, with her esteemed best friend Georgia “Tuffy” Mitchell, Passamaquoddy (whom she referred to as Molly Molasses). She never ceased to create art and literature. ssipsis lived and died as she wanted to: not by anyone else’s rules. She is survived by her children and their families. Kimberly and husband Robert Bryant (whom she regarded as a son), and their daughter Ganessa Anne and her husband Jeremy Frey and their sons Damien and Gavin; their son Lloyd Kenneth, and daughter Leya Kimberly; son William “Bill” Quincy Thompson and wife Lisa, their Gabriel Louis Paul, and daughter Jasmine Adelaide; daughter Susan Pi’htalo Galen and Smokey Bear; daughter Pamela outdusis Cunningham and her sons Jacob Aloysius and Henry Philip. Husband Peter Aloysius Cunningham awaits ssipsis in heaven, having passed seven months previous. The two shared a strong bond. ssipsis was the baby to siblings Ralph, Betty, twins John and Joseph, Jack, Tom, Quint, Robin, Gus; and many nieces and nephews. Thank you to her “warrior sister” Carol Dana, for always being there for her, and for us, to the very end. Please come eat with us in honor of ssipsis, at the Indian Island Community Building, 12 Wabanaki Way, Indian Island, ME., on November 7th, at 11:00 am. There will be stories to share, traditional drumming and Penobscot ceremony.